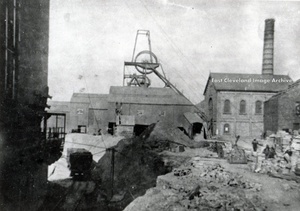 A sideline at Lingdale Mine was the manufacture of bricks made from the waste shale. In the photo piles of bricks are stacked at the right hand side, with pallets of bricks being hoisted and lowered by the rope hoist system in the Photo. Down into the rail wagons below. An excellent description of the plant and it’s working is given in Simon Chapman’s Book “Lingdale Mine”. Image courtesy of George Pearson.